Over at Jeff Shyluk's Visual Blog, Jeff has posted a year one review of his website. Jeff made extensive use of Blogger's relatively new stats features, and I am therefore stealing his idea to post a quick year-end analysis of My Name is Earl (J. Woods). All stats begin in May 2010. I'd be very interested in knowing what appeal this blog has to someone from, say, Latvia, so I welcome any and all international guests to post comments. If I'm reading Blogger's stats page correctly, this blog has attracted 7,916 pageviews since May. I have no idea if that's a lot in the world of blogs, but it doesn't seem too bad to me, given the haphazard nature of my posts. 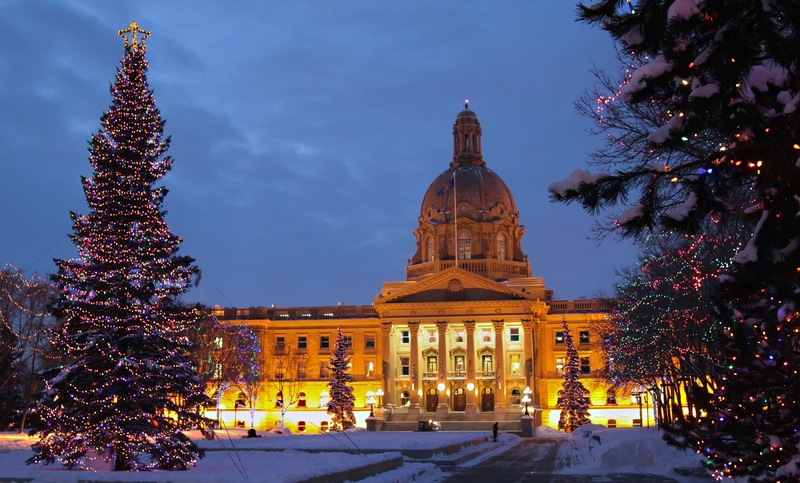 There's no real unifying theme to this blog; it's mostly a collection of my random thoughts on pop culture, politics and daily life in western Canada. Writers thrive on readership like thirsty emotional vampires, so I'm doubly appreciative of everyone who visits. 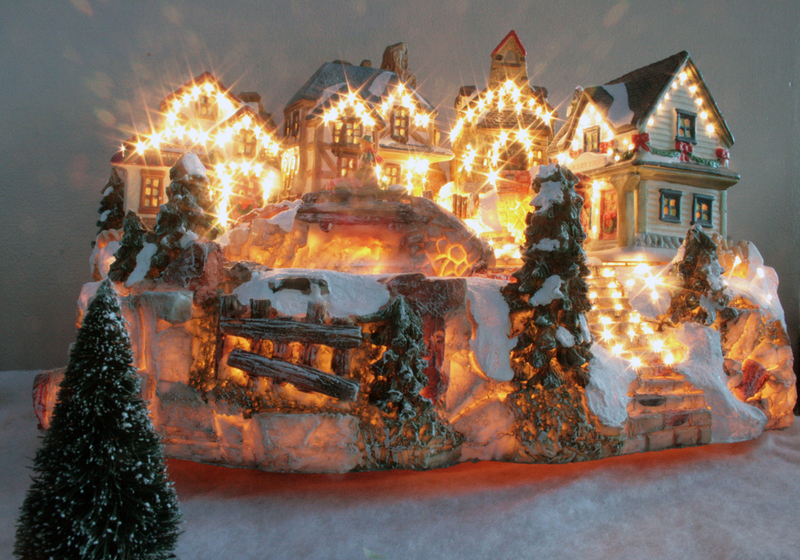 I hope you and yours have a great New Year's celebration tonight, wherever you may be. And may 2011 be a banner year for you, yours, and everyone on our good, green earth. Mom and Dad's new crokinole board. 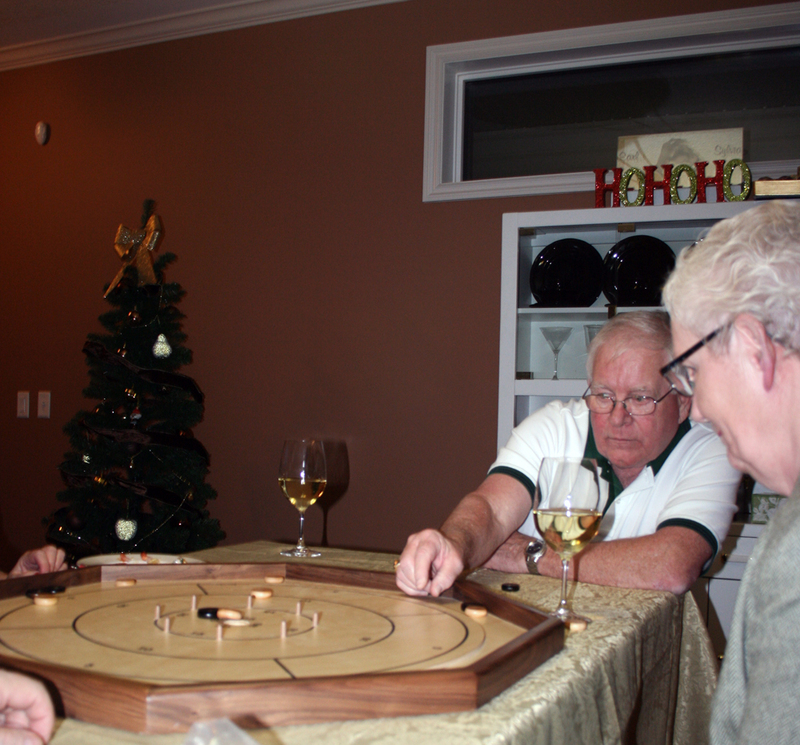 Mom and Dad purchased a new crokinole set a few months ago, so I invited them to bring it over on Christmas day. I had forgotten, however, that Dad is very good at this game - so much so that he and his father, my grandfather William James Woods, were allowed to compete in tournaments, but banned from playing on the same team. 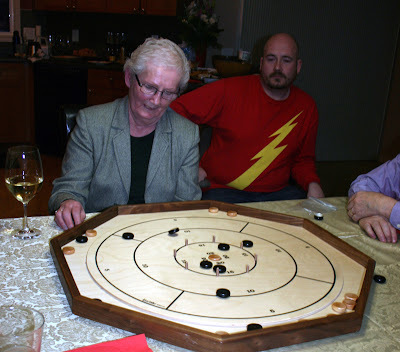 Dad hasn't lost any of his skill, or if he has, he must have been a fearsome spectacle during the competitions of his youth. Sean and I struggled to beat him, succeeding only once. 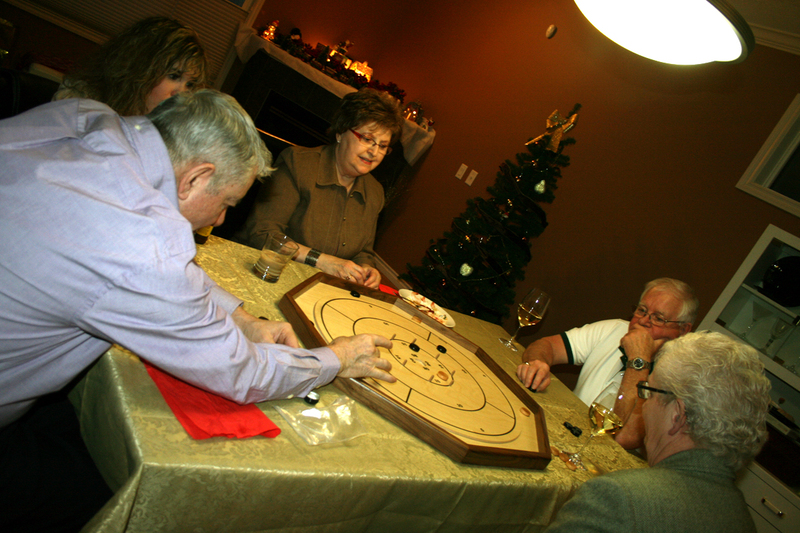 Sylvia and the in-laws were similarly overwhelmed, although I should note that Mom is pretty good too, and the in-laws picked up the game pretty quickly. Sylvia's dad flicks his disc. 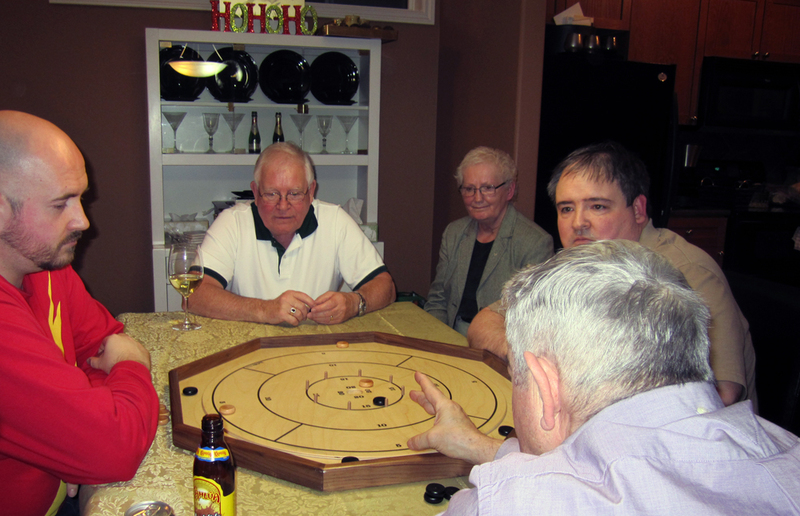 Crokinole is a Canadian game, about a century old. 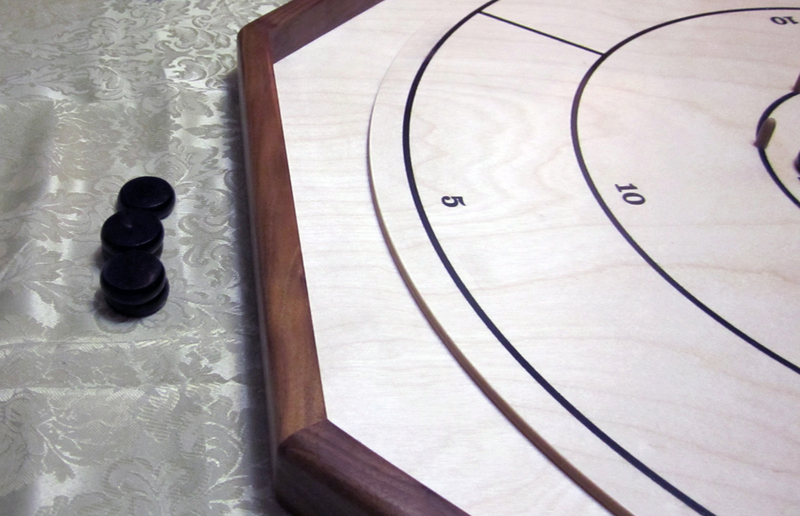 It's similar to curling or shuffleboard; the idea is to flick wooden checkers (called "discs" in the game's parlance) with your finger toward the centre of the board, knocking opponent checkers out of the arena. The first person (or team) to reach 100 points wins. A disc bounces into the ditch. A black disc bounces unsuccessfully off Mom's bullseye-occupying disc. 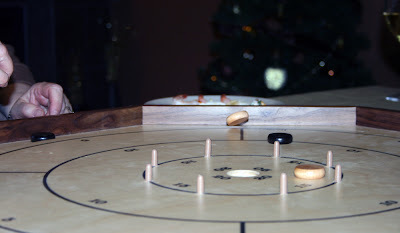 The game can get pretty fierce when a disc falls into the slightly depressed bullseye; under certain circumstances, it's permissible to attempt to flick the checker out of the hole. If flicked with sufficient force, checkers can turn into projectiles quite capable of knocking over beverage containers or bruising skin. There's a so-called "one-cheek rule" which states that players cannot stand or leave their chair when shooting; they may lean over if they need to, as long as one buttock remains in contact with the seat. This can make some shots pretty tough. 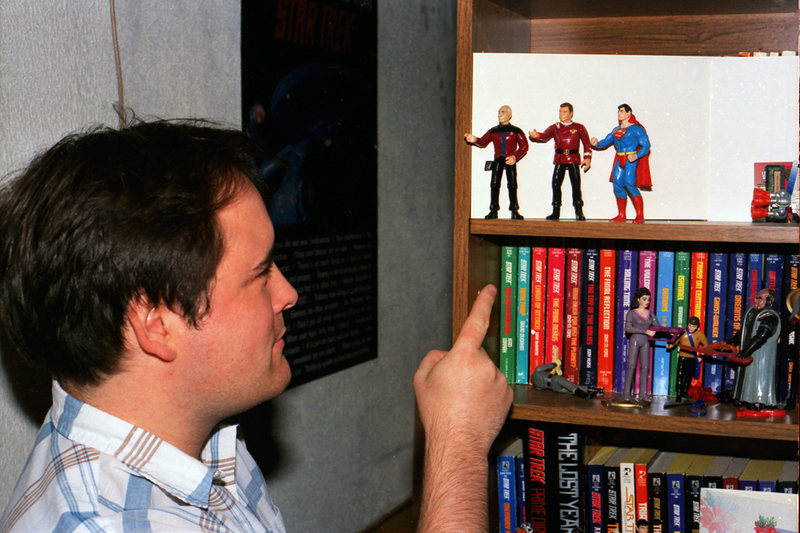 I've been a huge space exploration buff all my life. 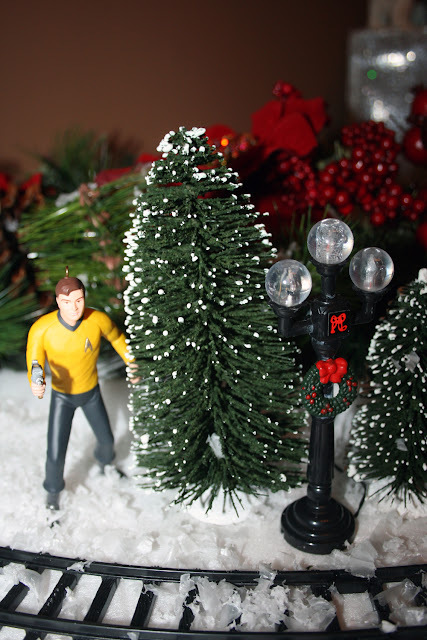 Here's a holiday message from Expedition 26 astronauts/cosmonauts. 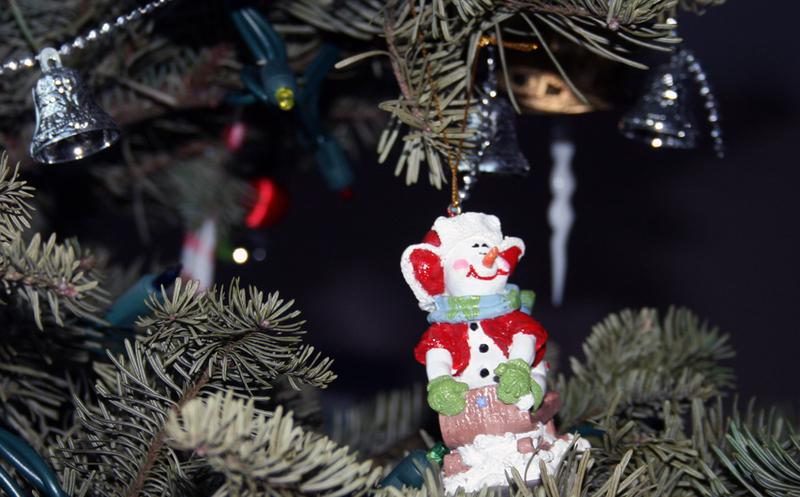 Dig the floating Santa and Christmas tree! A couple of folks have noted that the red curtain theme was causing the blog to load pretty slowly, so I've switched to a less graphics-intensive theme. Please comment if you notice a difference, pro or con. 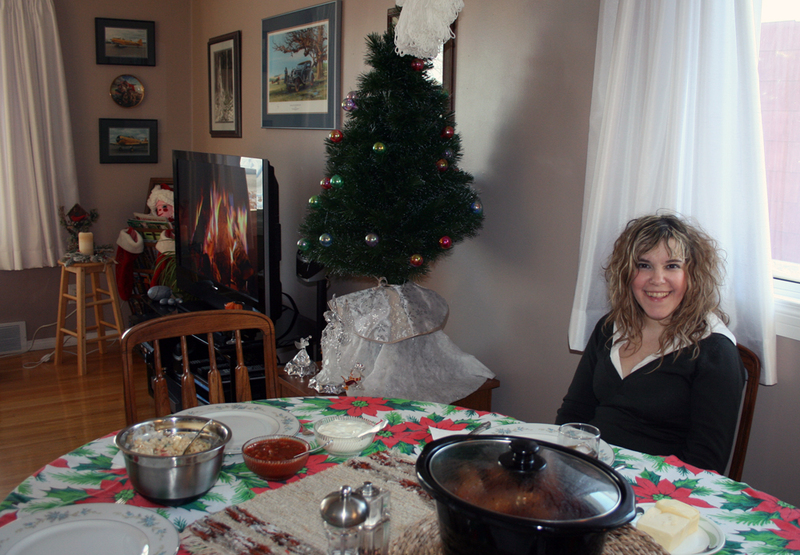 On Saturday, Sean and Sylvia and I went to Mom and Dad's place in Leduc for an early Christmas lunch. 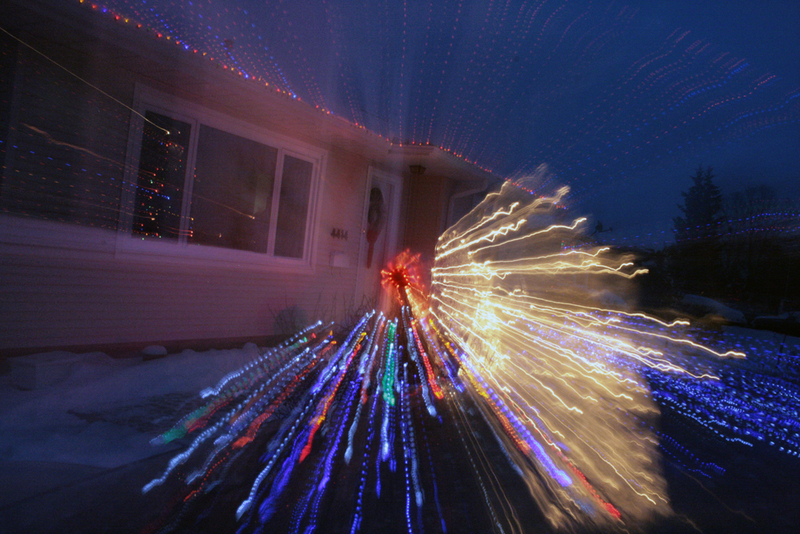 I spent some time fooling around with shutter speeds and aperture settings to capture some festive imagery. Can you spot the famous Log Channel? 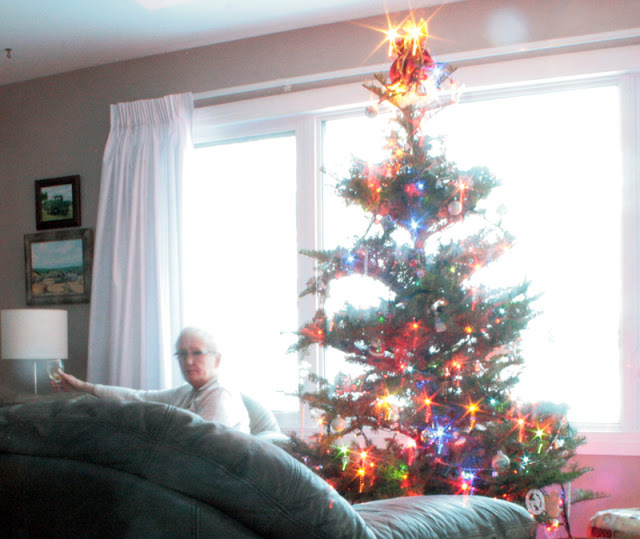 Sylvia and I aren't into Christmas as much as some other folks, but we do both enjoy a few aspects of the holiday: the music, the lights, the chance to get together with friends and family, the decorations. 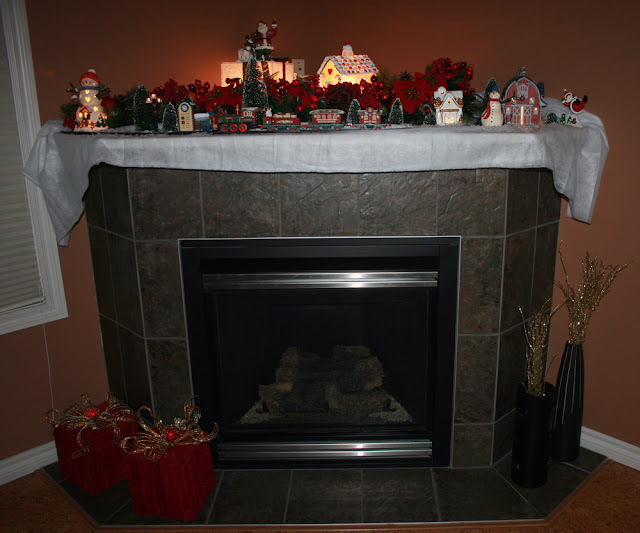 Since we now have a fireplace, we thought we should get into the holiday spirit by sprucing it up a little. 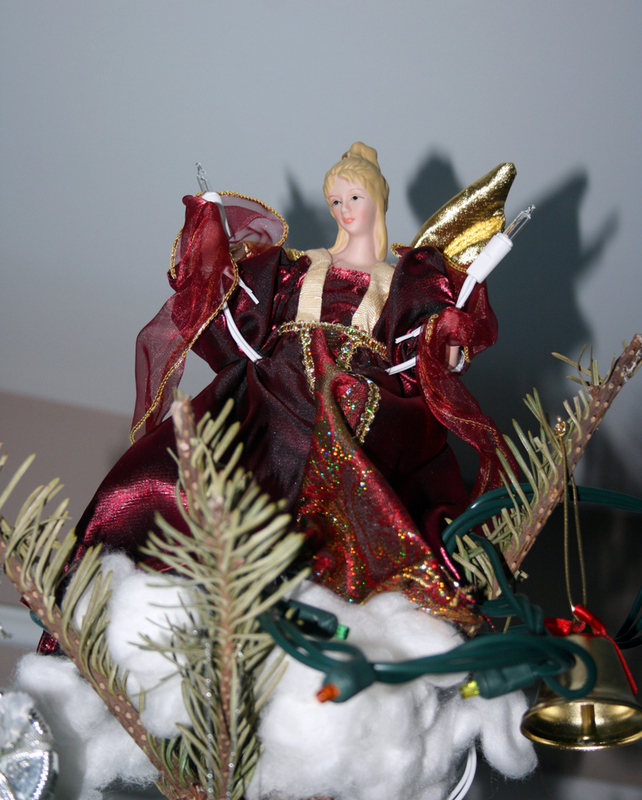 Sylvia decorated the tree. At first I was skeptical regarding the copper/bronze colour scheme, but I have to admit Sylvia's choices won me over. It even matches our wall and floor. I'm sure that this is related to graphic design somehow. 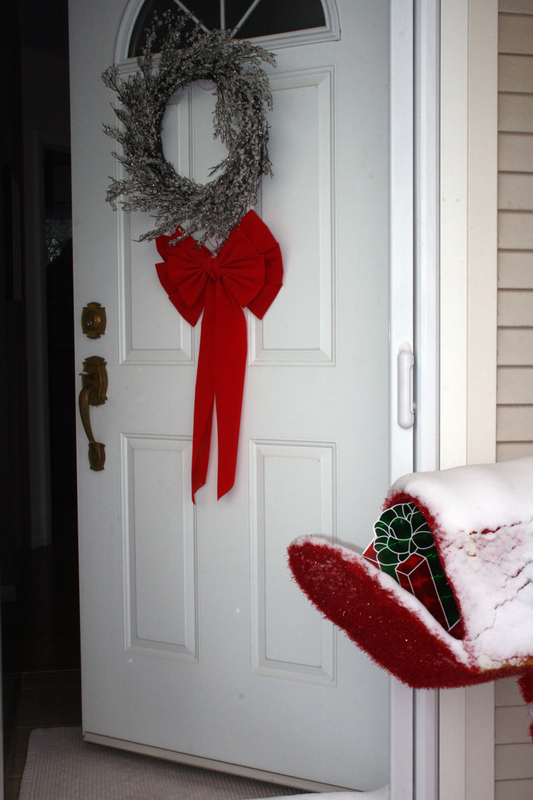 Maybe my Christmas ads don't have to be exclusively red and green. Fans have been waiting for The Six Million Dollar Man (and its spinoff, The Bionic Woman) to appear on DVD since the format’s debut. At last Time-Life has released the entire series in a handsome box set that includes all five seasons of the show, all the crossover episodes of The Bionic Woman, all the reunion telemovies and a collection of comprehensive featurettes and audio commentaries. The first season of The Bionic Woman is also available, with a less impressive but still satisfying collection of special features, including The Six Million Dollar Man crossover episodes and some very informative – even moving – audio commentaries from Bionic Woman creator Kenneth Johnson, later famous for The Incredible Hulk and V. I just finished watching the first seasons of each show, and they still stand up as wholesome entertainment, generally uncomplicated and sometimes less ambitious than they could have been, but fun. The Six Million Dollar Man tells the story of “Steve Austin, astronaut…a man barely alive” thanks to a terrible plane crash that costs him three limbs and an eye. His lost parts are replaced with bionics, artificial replacements that make him “better…stronger…faster,” in the immortal words of the show’s opening montage. The spinoff series, The Bionic Woman, arose out of a popular second-season two-part episode of The Six Million Dollar Man that introduced audiences to Austin’s high school sweetheart, Jaime Sommers (Lindsay Wagner), transformed into a bionic woman because of a convenient (for narrative purposes if not Jaime) skydiving accident. Every week, Steve and Jaime performed astounding physical feats to save their country and sometimes even the world from terrorists, criminals, spies, saboteurs, robots, aliens and rogue space probes. They crashed through stone walls, threw fence posts hundreds of metres, ran at highway speeds, screwed on lug nuts with their bare fingers and tossed bad guys around like paper dolls. This was pretty heady stuff for the children of the 1970s, who were naturally excited by the idea of being faster and stronger than humanly possible. (Kids didn’t seem to mind that horrific accidents were a prerequisite for bionic augmentation.) Back in grade school, I used to amaze friends with my ability to arch one eyebrow to express surprise or skepticism. Nearly everyone assumed I was emulating Star Trek’s Mr. Spock, but in fact I was aping Lee Majors, the six million dollar man himself. Like Spock, Major’s Colonel Steve Austin cocked a mean eyebrow. The Six Million Dollar Man was one of a select number of genre shows broadcast way up north when I was living in Leaf Rapids, Manitoba. 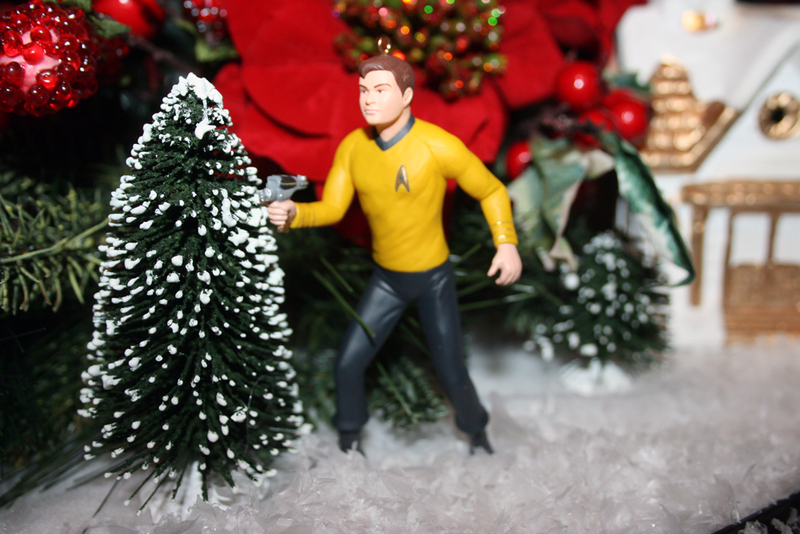 (The others were Star Trek, H.R. Pufnstuf, and Space: 1999.) Our television only received three channels, one of them French, so choices were limited. Fortunately CBC was pretty genre-friendly in those days, giving my friends and I ample fodder for the imagination. As often as we played cops and robbers, Fantastic Four or Star Trek, we pretended to be bionic boys and girls. I may not have possessed bionic strength or speed, but my eyebrow action was pretty convincing, at least on the playground. A cousin had the famous Kenner Steve Austin action figure, complete with plastic engine block (to demonstrate Steve’s amazing strength) and see-through “bionic” eye. A friend had the less popular Oscar Goldman figure; Oscar was the head of the Office of Scientific Intelligence, the organization that employed Steve and Jaime. Oscar had one accessory, the infamous exploding briefcase, which didn’t really explode at all; if you opened it in a certain (read: wrong) way, you’d see a sticker lining the briefcase exterior that made it look like Oscar’s stuff had been blown up. Open it another way, and you’d see a different sticker depicting the contents as intact. Cool! Revisiting the series has been a joy. Before now, I’d never seen the three original telemovies that opened the series: “The Six Million Dollar Man,” “Wine, Women and War” and “Solid Gold Kidnapping.” The eponymous first telemovie is the best of the three, and as with many pilots, there are a number of significant differences in texture and tone from the series proper. While Steve Austin is known as a military colonel in the series, here he’s portrayed as a civilian astronaut, the last man to visit the moon. He’s a bit of an anti-authoritarian figure, laid back, maybe a little snide. After his plane crash, he’s lost, vulnerable, even suicidal. This episode is far darker and more mature than the series that followed, treating the accident with the horror it deserves; when Steve wakes up minus three limbs and an eye, it’s hard to watch a formerly proud and independent man struggle to adjust to his new reality. Austin is horrified at first when Dr. Rudy Wells presents his new arm in a display box, not wanting to be transformed into a freak or a monster. The limits of the new limbs are treated realistically; while the fake skin has sensors, when Steve asks if he’ll really have a sense of touch like he did before, the question is answered with a heavy dose of evasion and embarrassment. He’s not the same man he used to be, and while he may indeed be faster and stronger, he’s not necessarily better. Spencer isn’t shy about letting Steve know that the government expects to be paid back for its six million dollar investment. Strange opening for the second and third Six Million Dollar Man telemovies. Of course Austin does survive. After two more telemovies, which oddly enough try to transform Austin into a James Bond-like figure complete with tuxedo, supervillains and exotic, willing women, the series proper begins. 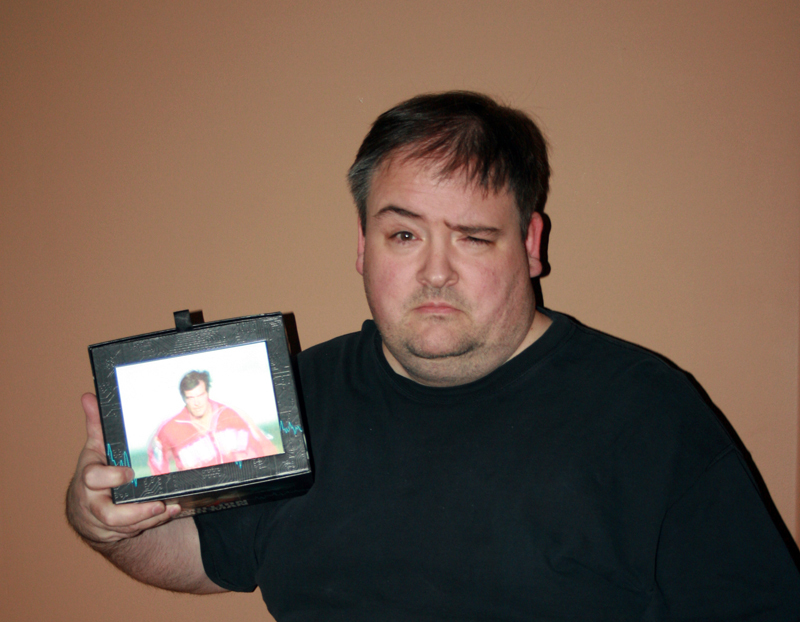 Early episodes explore Steve’s continuing ambivalence about his situation. Whenever he’s forced to use his bionics in front of witnesses, he explains the situation with discomfort: “I had an accident…they gave me some new parts,” or words to that effect, always with a degree of uncertainty and perhaps even shame. The first season features a number of notable guest stars, including George Takei, John Saxon, Greg Morris, Farrah Fawcett (as astronaut Kelly Woods – no relation) and, in a bizarre, over-the-top performance, William Shatner. Shatner plays an astronaut who returns from a space mission with strange new perceptions and powers, abilities that eventually drive him insane. 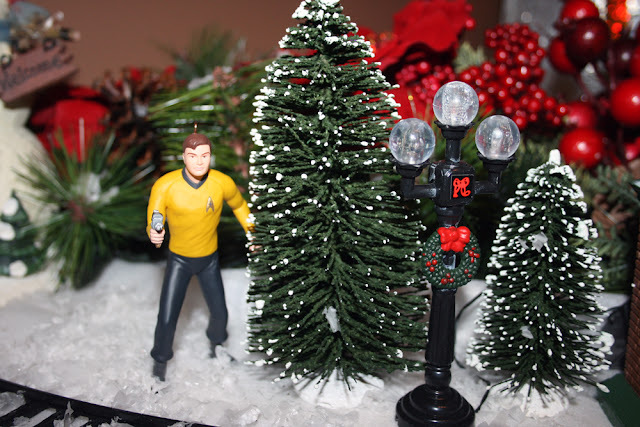 Shatner’s scenery-chewing is a thing of wonder, and I’m honestly uncertain as to whether it should be judged as transcendental genius or the nadir of his career. There are some interesting technical glitches in the first season; one line of Majors’ dialogue seems to be read offscreen by a production assistant, as if they forgot to loop in Majors’ line during ADR. It’s quite jarring to see Austin’s lips moving with the sounds of someone else’s voice. Expensive stunt footage is reused frequently, sometimes in back-to-back episodes. 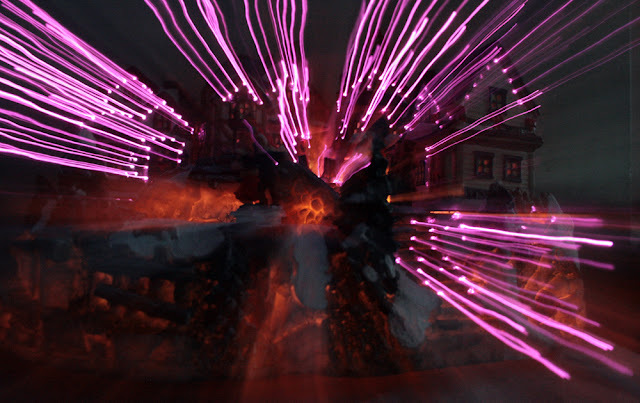 And there are some very strange sudden zoom effects, as if to hide special effects rigging. But these oddities only add to the show’s charm. Even as a product of the cold war, the bionic shows are curiously apolitical. Steve has several sympathetically-portrayed cosmonaut friends, and works with the Soviets on more than one occasion, presumably thanks to détente. The OSI seems to have no overt political agenda other than to protect military secrets, rescue hostages, conduct scientific experiments and complete other miscellaneous do-gooder tasks. They fight terrorists, deranged people and common criminals more often than ideological enemies. Then as now (see The West Wing and 24 for more recent examples), when our heroes do tangle with other nation-states, the enemy countries are generally thinly-disguised fictional analogues. The first season’s special features reveal that series producer Harve Bennett – formerly of The Mod Squad, later to revive the Star Trek motion picture series – intoned the famous “Steve Austin…a man barely alive” voiceover for the opening credit sequence. Bennett has some fascinating stories about the show’s production, including Lee Majors’ enthusiasm at performing his own stunts, the challenges of small budgets and tight deadlines, the huge ratings success of the show and its distaff spinoff, and even the tale of the real pilot injured in the stock crash footage used to depict Austin’s accident. The Six Million Dollar Man: The Complete Series is a pricey package, available for purchase only online at Time Life, but with over 100 adventures and a plethora of special features – not to mention the very handsome packaging, complete with lenticular art and sound effects – it’s worth every penny for fans of science fiction, nostalgia, or 70s kitsch. Having lived in northern Manitoba for a decade, I don't complain about Alberta winters very often; even at their worst, they're relatively mild compared to what I'm used to. But today was pretty grim, not because of the cold (it was only minus 12 or so), but the snow. Our new home exists in a cul-de-sac, and my car barely made it into our condo complex entrance, and getting to the garage was an even greater struggle. It doesn't really look so bad in the video, but I very nearly got stuck out there in the dark. Good thing home was only a few steps away. Here are some nice holiday thoughts from Dr. David Swann, Leader of the Official Opposition. If anyone knows how to ensure that YouTube videos display properly when embedded instead of being cut off on the right, I'm all ears...the non-cut-off version can be viewed at http://www.youtube.com/watch?v=u_b9WQQnZiU. Last month I received my umpteenth Nigerian advance fee fraud letter. Most savvy internet users are familiar with these desperate missives, characterized by their eccentric use of the English language, bald-faced flattery and promises of great riches for just a tiny investment of trust...and cash. In case you are interested; please email me your direct telephone number for discussion of this deal in further details. (Oh, straight away!) If you give me positive signals, I will initiate the process towards conclusion. Best Regards. Hon. (Dr.) GOODLUCK DOUGLAS GRAYHAM. (1). This e-mail contains information which may be protected by Law from disclosure and is intended only for the use of the addressee(s) of this e-mail. Other than the addressee (s) of this e-mail, reading, copying or distributing this email is prohibited. (I'm sure you won't mind me posting it on my blog, though...) If you have received this email in error, please contact the sender immediately. Here endeth the letter, and my mockery. Nigerian advance fee fraud emails always make me sad. On the one hand, these scam artists have successfully bilked people - many of them on fixed incomes - out of millions of dollars. On the other, they tarnish the reputation on an entire nation, one already suffering from poverty, disease, environmental devastation thanks to exploitative resource extraction, crime, corruption, lack of infrastructure and a host of other serious problems. It's not difficult to see why some Nigerians turn to fraud schemes; those of us lucky enough to live in rich countries can't imagine the level of desperation fostered by such a lack of opportunity. Of course scam artists are culpable for their actions, but if there are no excuses, there are at least understandable reasons for their acts. It's easy to be pessimistic about Africa's future given the lengths to which people are driven, but there is hope. Nigeria is home to one of the United Nations' twelve Millennium Villages; each village serves as an example of how the UN's Millennium Development Goals can be met by African citizens. If you need a dash of hope, tempered with a dose of realistic short-term expectations, I encourage you to read the links. With its vast natural resources and population, remarkable history and cultural diversity, Africa will one day free itself from poverty and disease. I look forward to a day when email scams will be a joke not just to us, but to Nigerians, who will have long grown past the need for them. 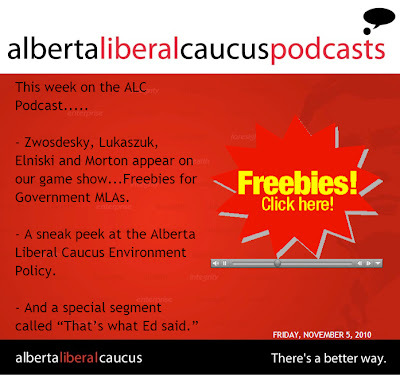 The fall sitting of the Alberta Legislature wrapped up last Thursday, and my colleague Tanara has created one last Alberta Liberal Caucus podcast for 2010. Listen here. Most folks tend not to pay too much attention to the length of time legislators spend in the legislature, but I think it's important to note that Alberta MLAs spend less time in the house than any other jurisdiction in Canada save Prince Edward Island; this fall sitting lasted only a few weeks, for example, and each "week" in the legislature only lasts four days. That doesn't leave a lot of time for question period or debate, the cornerstones of our process of democratic accountability. 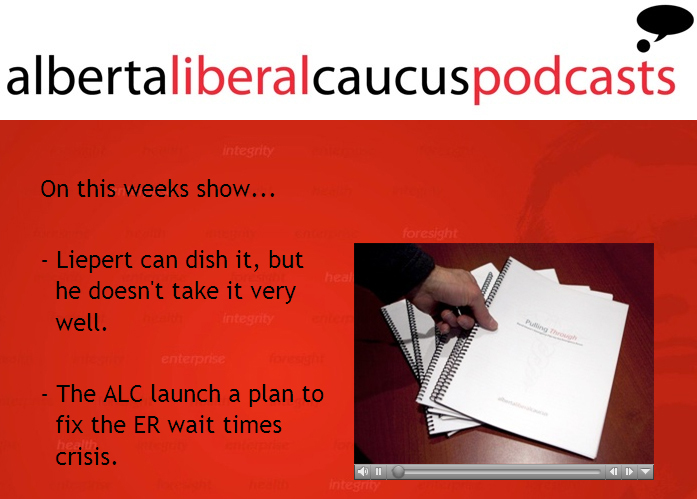 This episode reveals just how little time the Premier devotes to that process. I greet the end of each legislative session with mixed emotions. On the one hand, I'm disappointed that the time for debate and discussion is cut short in Alberta; on the other, session is pretty exhausting for caucus staff (and MLAs! ), so the slightly less hectic pace is welcome. Kevin Taft's book Democracy Derailed explores the problem of short legislative sessions and a host of other issues in far greater depth and with more insight than I can offer here. Daveberta posted a good review of the book a couple of years back; you can read it here. Or you can read Calgary Grit's review here. 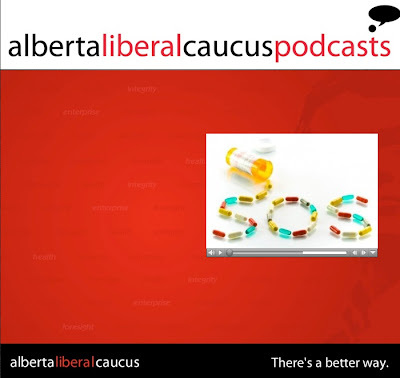 My colleague Tanara McLean has put together another fun podcast that illuminates the silly side of the serious issues that drive Alberta politics. 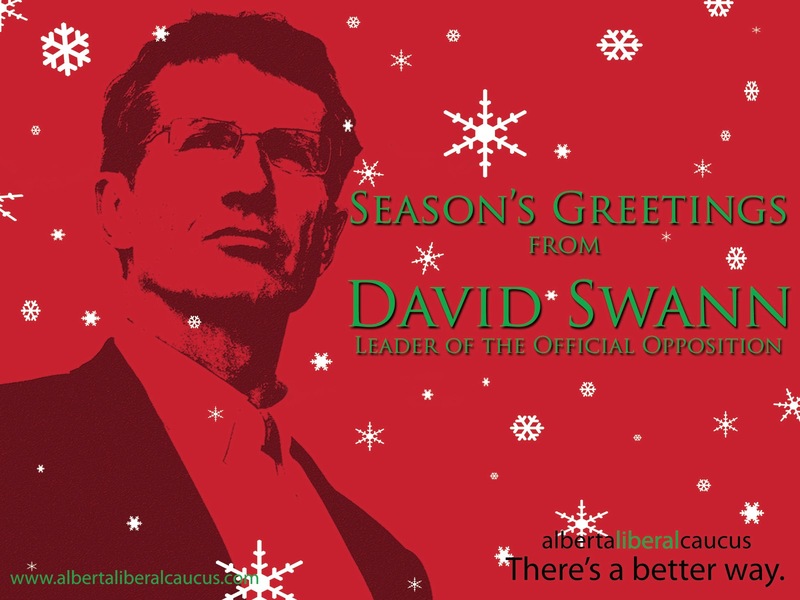 The songs about Alberta politicians, including Official Opposition Leader David Swann, are a sceram. You can listen to the podcast here. Jeff and Susan Shyluk have been staying with us the past few days to participate in the Grey Cup festivities. I had no idea that the event lasted more than a single day, but Susan and Jeff have been partying hard since their arrival on Wednesday. Now the game itself has started, and they're in the stands at Commonwealth Stadium cheering for the Saskatchewan Roughriders. Sometimes I'm called upon to write speeches for politicians who attend sporting events, and this time was no different. It's always a bit of a challenge for me to write from the heart about sports, since they've never really caught my interest. So I tend to dip into the well of sports cliches and hope for the best. I'm sure the fans are more focussed on the field than they are on the halftime speeches anyway. Jeff is wearing an old-timey football hat of the sort I remember from a Three Stooges short. These, apparently, were the helmets of the "leathernecks." They don't seem to offer much protection; hopefully Jeff won't be hit in the head by a stray football during the game. Every once in a while Sylvia forces me to break out of my shell of introversion. 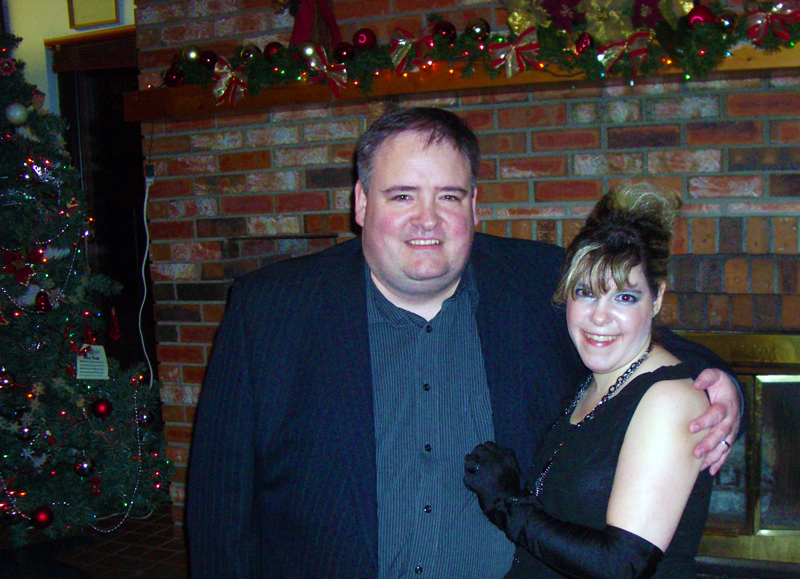 Last night, for example, we attended the Alberta Pension Services Corporation's annual Christmas party, and I surprised myself by schmoozing a little and having a great time. Sylvia was as magnetic as ever, working the room like a pro. In all honesty, perhaps she's the one that should be thinking about running for office. I'd vote for her! 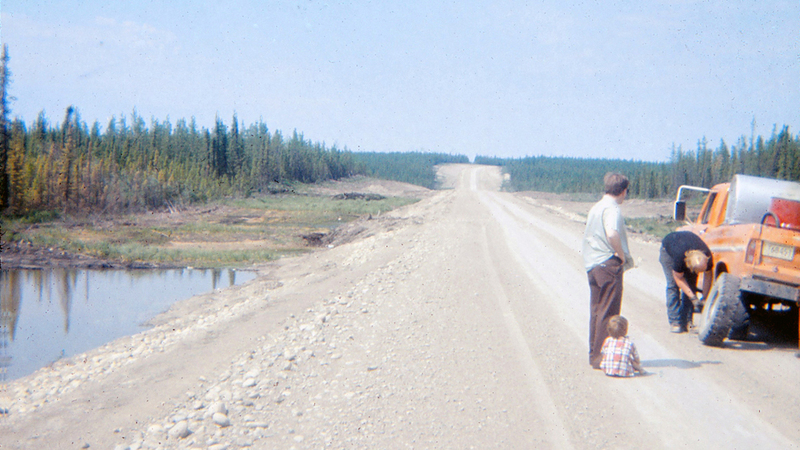 Fall 1973, on the road from Leaf Rapids to the Ruttan Mine, just after Mom and Dad and I moved there from Thompson. Mom and Dad think the fellow changing the tire is Donny Rayburn, a family friend. The reason why Dad and I are watching Mr. Rayburn change a tire, or why Mom took a photo, is lost to the mists of time. 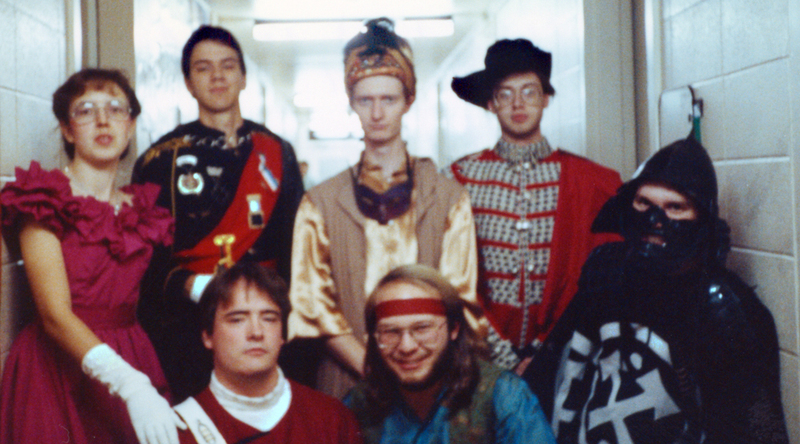 I've been scanning old slides and negatives this weekend, and came across this bizarre gem from 1995. 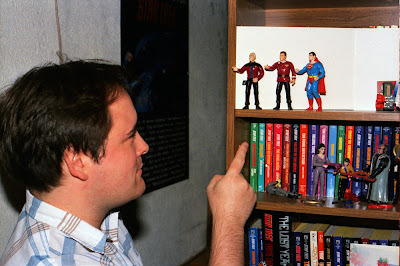 I don't remember much about it, except that I posed before this miniature supreme court of accusatory superheroes and asked Jeff Shyluk, "Does this look silly enough?" "Yep, sure does," he answered, snapping the photo. 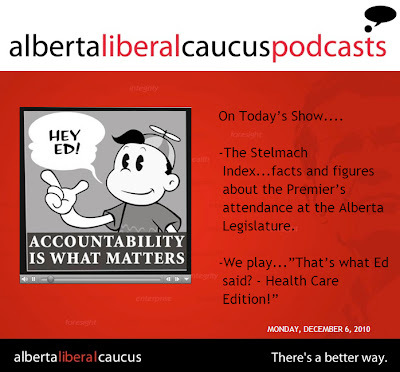 I can scarcely believe how Alberta Health Services CEO Stephen Duckett reacts to questions in this video. 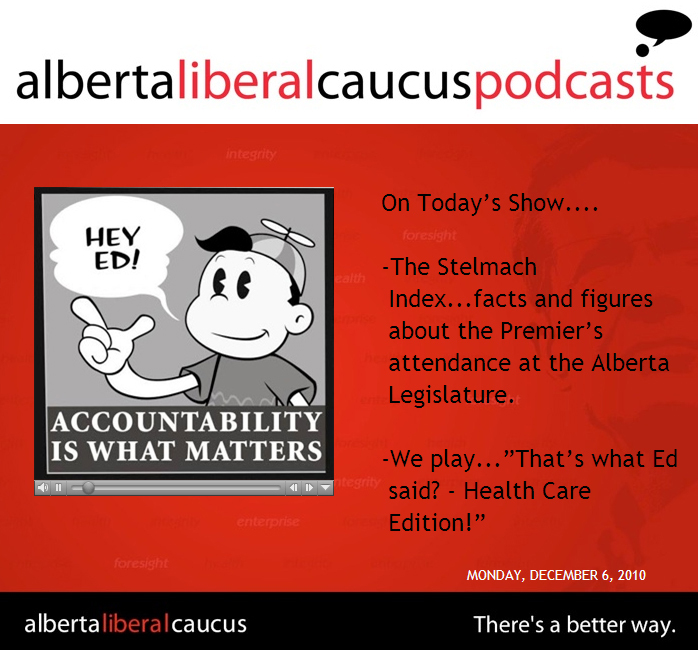 If you've been following the continuing Raj Sherman story, you'll know that the Tory MLA and (parliamentary secretary for health) attacked first the Premier, then Alberta Health Services, and now former Health Minister Ron Liepert for the emergency room crisis now facing Alberta. Earlier today some reporters tried to track Mr. Duckett down, and as you'll see in the video, he responds with "I'm eating my cookie" repeatedly in a childish falsetto, at one point even shoving his cookie in a reporter's face. I'm sure Dr. Duckett must be under a good deal of stress right now, and boy, it's really showing. In this week's Official Opposition podcast, Official Opposition Leader David Swann talks about the Raj Sherman/emergency room wait time crisis affair. Tanara also found an amusing compilation of Bushisms, inspired by Premier Ed Stelmach's odd (but not incorrect) use of the word "ironical" during Question Period. As an aside, I designed the podcast logo seen at the top of the screengrab above - if you can call the addition of a dot and a word balloon to some text "designing." It only took about five minutes to come up with this, but I think it looks okay nonetheless. Rubicon was an odd little show. For the bulk of the series, virtually nothing happened - at least, "nothing" by the standards of modern film and television storytelling. The atmosphere was moody and unsettling, the pace glacial, the characters restrained, even ordinary, the plot Byzantine. There's little humour. I loved it. Of course it couldn't last. Rubicon was about a small group of intelligence analysts fighting the war on terror. They worked for the American Policy Institute (API), a nondescript little agency in a nondescript brick building hidden away in the labyrinthine urban maze of New York City. Protagonist Will Travers was a cool, distant hero-in-mourning, still suppressing all emotion since the loss of his family on 9/11. As the show opens, Will loses his mentor to a shadowy cabal of mysterious manipulators, including Inspector Sledge Hammer - or should I say, David Rasche, in a more serious role than his most famous. Determined to find out why his friend was killed, Will starts looking behind the scenes at API and slowly uncovers a grand conspiracy that threatens the security - and perhaps even the very existence - of the United States. Like its historical namesake, this was a series about an existential threat to democracy, a country's leadership prepared to cross the Rubicon in the pursuit of wealth and power. Unlike most other espionage shows, there was very little violence in Rubicon; only three people died onscreen, over the course of the show's single thirteen-episode season. Suspense built slowly as Will and his team slowly unravelled the threads of conspiracy, culminating in a final trio of episodes that rewarded the faithful few who stuck around to watch the entire series. Rubicon was, in other words, smart television. Or at the very least, it aimed higher than most TV dares these days. But viewership wasn't high enough to justify a second season, and so the series ended just as it began - with ambiguity, uncertainty, and a sense of building unease. There was enough resolution to satisfy those who followed the show, but it's still disappointing that we won't see Will and the others take the next steps toward (or rather, away from, given the show's premise) the Rubicon. Jeff was kind enough to note that my original podium sign had a lot of yang - that is, male energy, in graphic design terms. This version is a little softer. Here is a speech Lieutenant Governor Lois Hole delivered to the assembled masses celebrating Remembrance Day at the Butterdome on November 11, 2003. Her words here, perhaps unsurprisingly, echo my own feelings. I’ll begin today by thanking the Canadian Fallen Heroes Foundation for a new initiative that will help all Canadians remember those who gave their lives for freedom. The Foundation is creating remarkable posters that pay visual tribute to our soldiers, posters that will remind us of their sacrifice. It is a tremendously important project, because, after all, the lessons of history are lost if we allow our memories to die, even if those memories cause terrible grief. So to founder Mark Norman and everyone else who made the project a reality, I offer gratitude and congratulations. You’ve done history a great service. Art alone, of course, cannot keep the past alive; we need to keep the memory of the fallen in our hearts, and we need to pass that respect down to each generation. That is why, every year, we continue to recognize those who came to Canada’s defence in the hours of her greatest need. The 20th century was wracked by terrible wars time and again, but each time, without fail, Canada’s sons and daughters heard the call and restored peace and order to our world. And as the 21st century dawns, these brave and loyal soldiers continue to give up their lives as they try to bring peace, freedom, and stability to the world’s poorest, most desperate people. We can never truly repay our veterans for their heroism, but we can, and must, remember it. Not just for the sake of honouring the fallen, but for the sake of the millions of people on our planet—the current generation of Canadians among them—who have never had to endure the horrors of war, thanks to their sacrifices. November 11 is the most significant national event of the year, for without Remembrance Day—or rather without the soldiers who gave us cause to create Remembrance Day—we might not be celebrating the other national holidays we enjoy. We might not have reason to celebrate anything at all. Remembrance Day is one of our country’s most important and solemn rituals, an event that pays tribute to those who died in defence of our freedoms, and the surviving veterans who continue to be haunted by the memories of war. It is the duty of every Canadian to respect and honour the contributions of our soldiers. But at the same time, we have a still greater duty, an obligation to ensure that the efforts of our veterans were not in vain. For if we remember what our soldiers endured, perhaps we will someday find the wisdom to put war behind us. Eisenhower was right. Each war must be seen as a great failure of human imagination: a failure to identify the root causes of war, a failure to accommodate the genuine needs and grievances of our neighbours, a failure to address the conditions that give rise of dictatorships, a failure to repudiate violence as a means of effecting change. Our soldiers pay the price for our lack of imagination, and if we ever hope to close that bloody account, then we must find a way to bring lasting prosperity and freedom to all the peoples of the world. Peace will never come until all human beings enjoy good food, clean water, strong shelter, excellent schools, modern hospitals, fully stocked libraries, and the fundamental freedoms that we in the Western world take for granted. Therefore, the best way to remember the sacrifices of Canadian soldiers is to keep working towards the day when all human beings will at last put aside their petty differences and live as we were meant to: in peace. To do that, we must fight and win one last war: the war on poverty and ignorance. And given their dedication, bravery, and compassion, I have no doubt that Canadian soldiers will be leading the way, as they always have. So this Remembrance Day, I believe all of us should do two things: we should pay our respects to the thousands of Canadian soldiers who gave their lives for freedom, and then we should look for ways to ensure that one day, we can enjoy peace and prosperity without those sacrifices. It is the only meaningful way to pay the debt we owe our veterans. The original is 23 x 8 inches; the font is Myriad Pro. I played with Photoshop filters to change a professional photo of David into something approximating art. I added a drop shadow to the slogan to punch it up a little; you may not be able to see it unless you click to embiggen. 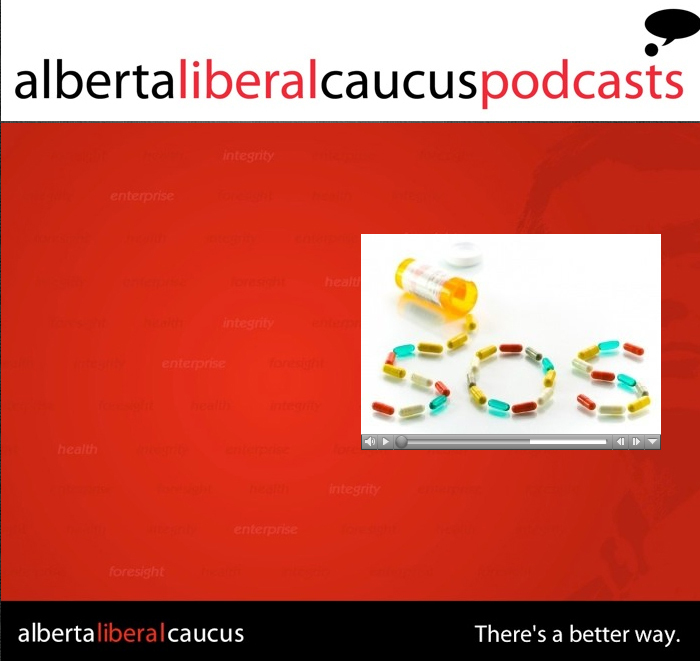 My colleague Tanara McLean has produced another fun and informative podcast for the Official Opposition. 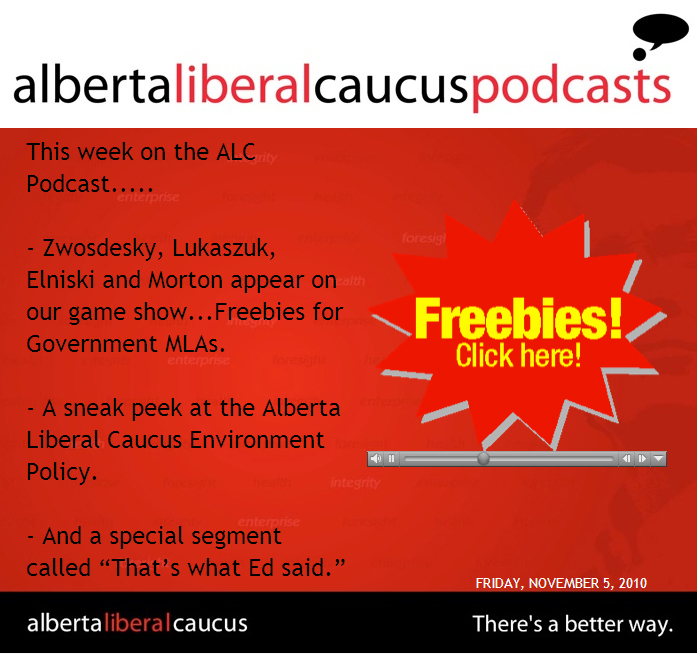 Listen as we mock the practice of government MLAs receiving perks such as fishing trips, golf rounds and tickets to Lady Gaga and Rod Stewart! Tanara also interviews Official Opposition Environment Critic Laurie Blakeman, and takes a gentle jab at our absent Premier...and I have fun hamming it up for some of the supporting voices. On last night's episode of Hawaii Five-O, the new Steve McGarrett had to deal with a hostage situation. He put on a disguise, but gave himself away, prompting the hostage taker to demand, "Who are you?" "I'm Five-O," McGarrett answers, which is meant to identify himself as a policeman to the alleged criminal. But of course, as already explained earlier on this blog, in the fictional universe of this TV series there's no reason for the slang term "five-o" to exist. This annoying error, combined with the constant use of shaky cam even for the simplest dialogue set-ups (have none of these people ever heard of a tripod? ), pedestrian, predictable plots and ADD editing, have put me off the show for good. I'll stick with the original series, most of which is now available on DVD. For tarnishing the legacy of one of the great cop shows, here's my final verdict: book 'em, Danno - murder one. 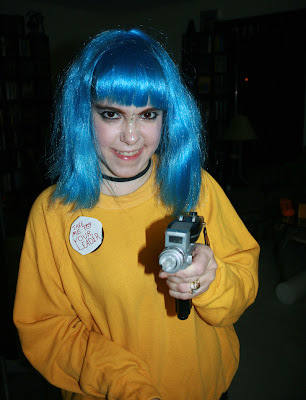 I've always loved Halloween. 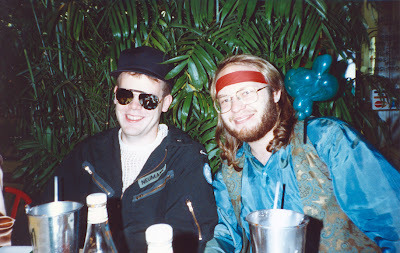 My first Halloween - at least, the first I remember - happened in Leaf Rapids. It was an unseasonably warm October that year - "unseasonably warm" for northern Manitoba meaning that it was merely freezing, with wet snow chilling me to the bone. I only remember that wet snow and the ghost costume my mother hand-made for me sticking to my skin, soaking. I think I had fun anyway. The next Halloween I remember happened in Leduc, grade five or six. I made my own costume this time; I was a robot. I stapled cardboard boxes together with a staple gun and covered everything in tin foil. There was a dance, and the costume was so hot that I felt faint...plus the staples were jabbing into my body. It was extremely uncomfortable. 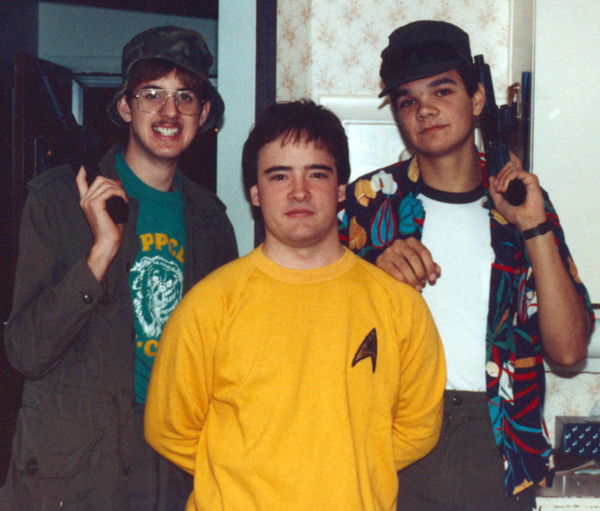 Here's a photo of Jeff Pitts and Kevin Kelly and me, ready to head out for some Halloween event or another in 1987. 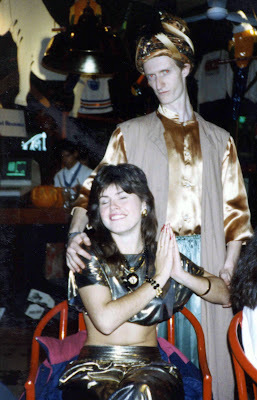 I don't remember anything about what we might have done that night; without this photo, I wouldn't have been able to tell you that I did anything for Halloween in 1987 at all. 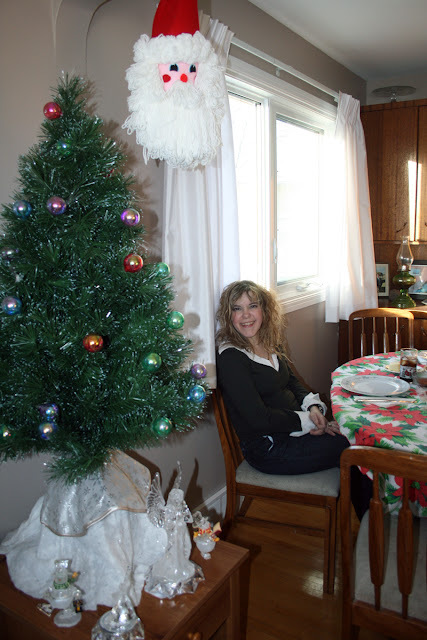 It's odd that this picture was taken at Mom and Dad's place in Leduc, since I would have been living at Lister Hall at the U of A at the time, in my first year of post-secondary education. I do remember Halloween 1990, though; a bunch of friends gathered at Earl's on the university campus and then headed over to Lister Hall for the Halloween dance. 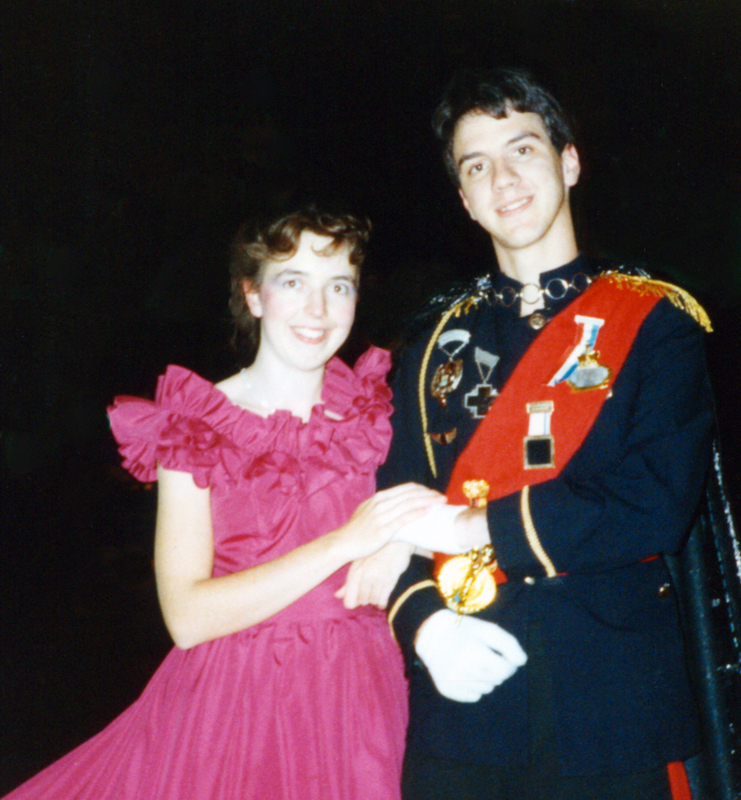 I think Ron Briscoe's defrocked priest was the best costume, although Jeff and Susan as Prince and Princess Charming were pretty awesome too. Then again, so was Tony's genie...and so was Carrie's harem girl. I'm not sure who Steven Neumann was supposed to be...I think Michael Snyder was a pirate. The next Halloween I remember was back in 1996, when Leslie, who was my boss at the time, took me to a GLBT-friendly Halloween party. She was a vampire, I was "Ensign Woods on shore leave." (That is, I wore my old grade nine home-made gold Star Trek tunic, beach shorts and carried around a frisbee.) No pictures of that event, unfortunately, but as you might expect because of gay stereotypes, the costumes were really terrific. The people were really nice, too, especially considering I was still pretty naive about gay and lesbian culture at the time. Sylvia's birthday falls just a few days before Halloween. I don't recall what we did for the holiday that year, but it was Sylvia's 35th birthday - the first I'd experienced as her boyfriend - and we celebrated the milestone by throwing a huge party. 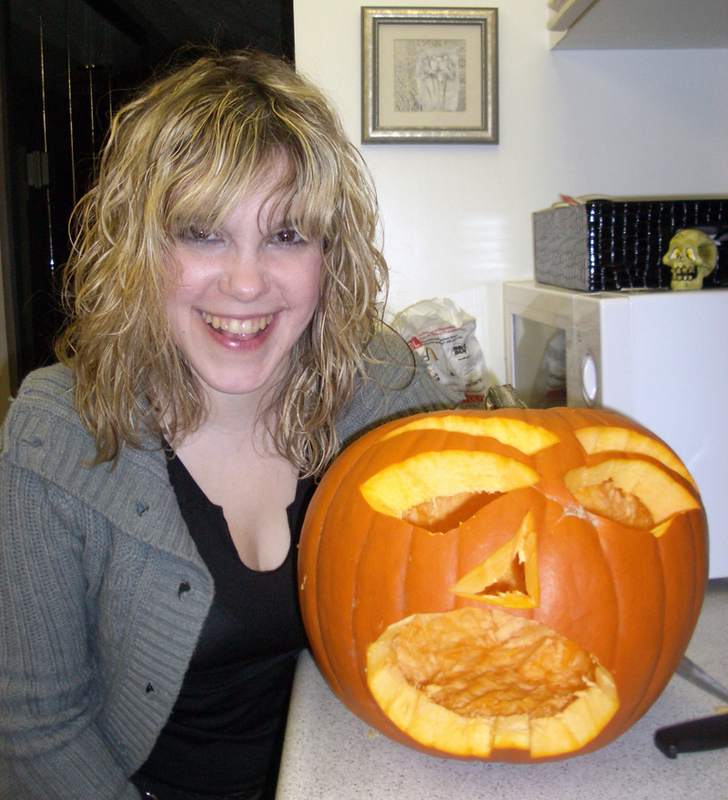 By 2006 we had our own home and were carving pumpkins together. 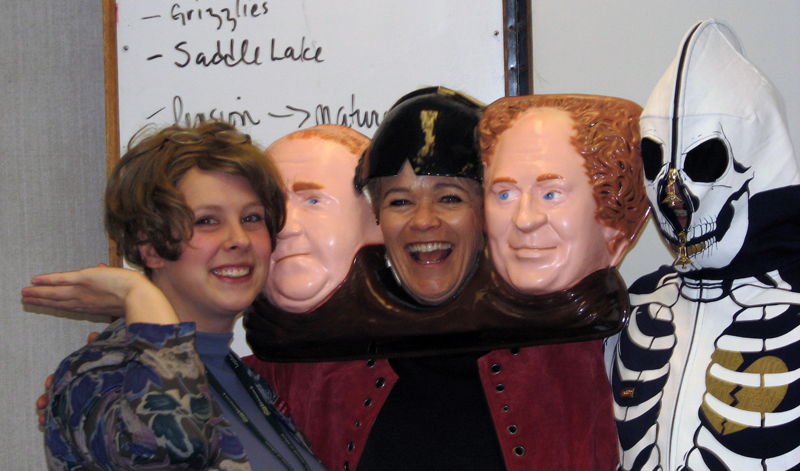 Only a few of the intrepid folks at the Official Opposition dressed up for Halloween in 2007, but our boss Judy was one of them, in an amazing Three Stooges mask. 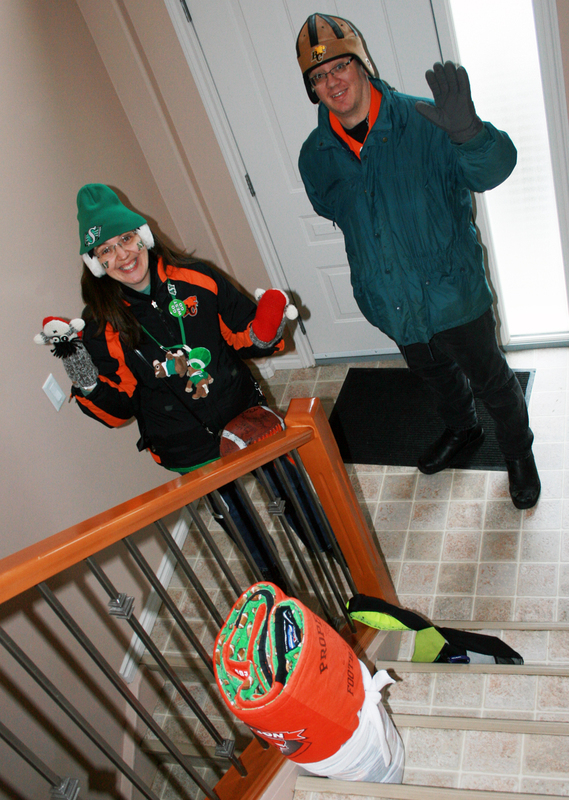 In 2008, Sylvia borrowed my phaser and my old Star Trek command tunic (originally made in grade nine!) to gently mock my pop culture obsessions. I wish I had more photos to prop up my Halloween memories, but these will have to do. Until next year...happy haunting.